Using a smartphone app, this research aims to understand real-time behaviors that put people at risk for tick bites and Lyme disease on Block Island, Rhode Island. “The Tick App” uses a combination of pop-up survey questions and geolocation technology to uncover how people’s day-to-day activities and movement around the island play a role in their risk for tick-borne diseases. This information can help to develop disease-control programs that take the lifestyle of the Block Island community into consideration and help develop educational programs to reduce disease risk. This ongoing study linked to the smartphone app (see project above), builds on a serosurveillance program initiated in 1991 to investigate the incidence of Lyme disease on Block Island, RI, and led by Dr. Peter Krause and colleagues from Yale University. The main goal of this study is to simultaneously assesses human behavioral and environmental risk factors for Lyme disease infection in an endemic area. We assess environmental risk by sampling ticks in subjects’ backyards and using high resolution satellite imagery to map and quantify the edge between lawn and woody vegetation where human-tick contact is more likely to occur. We are thus able to ascertain the relative role of behavioral and environmental risk factors on Lyme disease infection and the effectiveness of personal protective behavior. 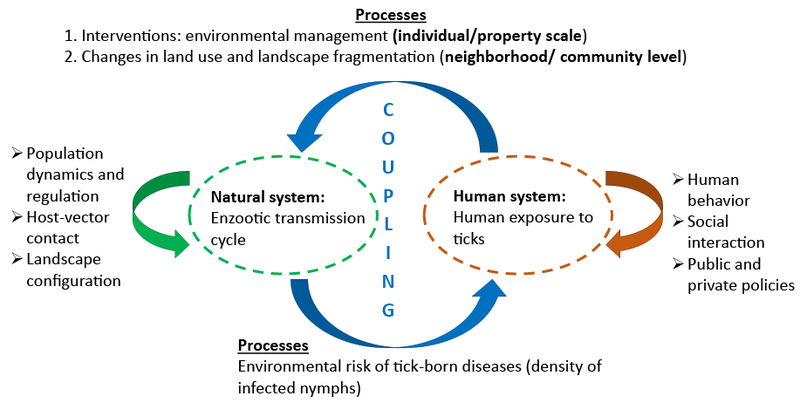 The dynamics of coupled natural and human systems in vector-borne diseases: the case of tick-borne diseases. Vector-borne diseases occur in the interface between human and ecosystem health, which are both interrelated and simultaneously affected by human activity, changes in land use and climate. However, nature-human systems are often studied separately, either as human systems with input/output to natural systems or as natural systems subjected to human disturbances, therefore failing to capture the complexity of their interaction. The integrative framework of Coupled Natural and Human systems (CNHs) allow us to address the complex dynamics of both biophysical- and human-driven systems, and their feedback and gain a better understanding of the processes behind the emergence and/or spread of zoonotic diseases. 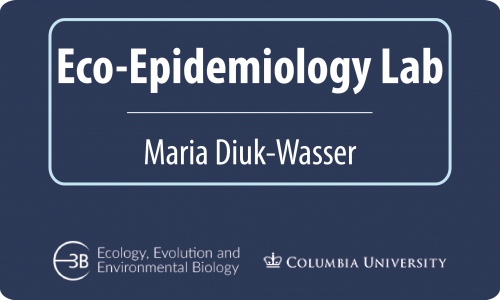 The goal of this project is to develop simulation models to characterize the reciprocal interaction and feedback loops between human behavior and environmental risk of tick-borne diseases and assess the impact of control interventions and prevention practices at a local scale in an endemic area and at a regional scale in Northeast US.